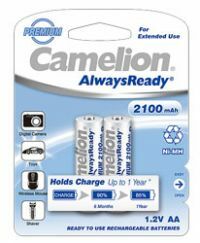 Energy And Money Saving,Pre-charged Ready to Use,No Harmful Chemicals Like Lead and Cadmium. To Recieve updates and possible rewards for Camelion AA 800 mAh AlwaysReady please sign in. To Recieve updates and possible rewards for Rechargeable Battery please sign in.